The Australian dollar extends steep fall into fourth straight day, driven by strong risk-off mode. Weaker than expected Australian Q3 GDP, released on Wednesday, dovish shift in RBA expectations and narrowing Oct trade surplus, add to negative sentiment, with solid Australian Oct retail sales, unable to improve the tone. Bears extend further today, following 1% fall on Wednesday and look for test of strong supports at 0.7199/95 (27 Nov trough / daily cloud top (0.7195) and 55SMA (0.7191). Cloud’s twist next week (0.7170) is also magnetic and sustained break below 0.7199/91 pivots would open way for extension towards 0.7163 (Fibo 61.8% of 0.7020/0.7393 / 13 Nov trough). 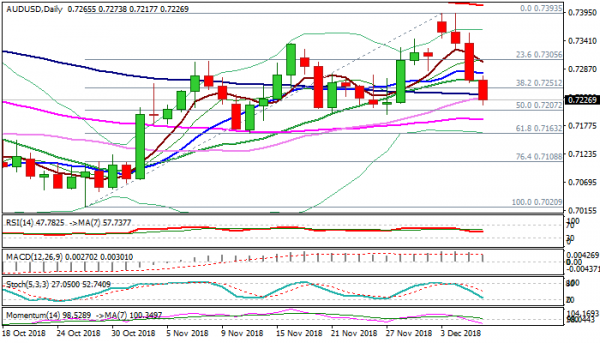 Rising negative momentum fuels bears, with broken 20SMA (0.7263) marking solid resistance and stronger upticks expected to hold below broken 10SMA (0.7279).